Join the Engage. Lead. Serve. 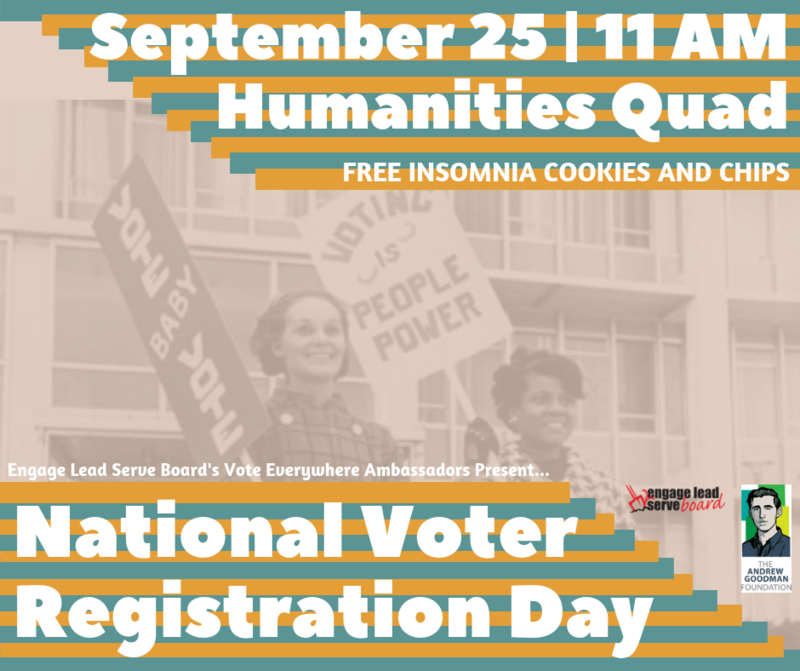 Board (ELSB)'s Vote Everywhere Ambassadors for some snacks as you register to vote! Get information about the upcoming elections, and experience a simulation of Kentucky’s new voting machine! Voting is a civic duty and a vital way to leverage your power. Sustainability demands civic engagement and the people's voice in policy-making. If you don't vote, the rich, the powerful, and corporate America will continue controlling our public offices. That means an endless continuation of the highly unsustainable status quo. Take a moment to register to vote now; take the time necessary to get to know the candidates on the ballot; and be sure to vote on November 6th and in every election of your adult life. No one else can do this work for you. It is up to us to take the reins.